Batman vs Superman - The Epic Superhero Clash! Batman vs Superman: The Epic Superhero Clash! Usually, you have some costumed superhero taking down the bad guys. Justice laying down the law. Good vs. Evil. Defeating the villains, protecting the innocent. That’s what superhero movies are all about, right? But what if the enemy to Justice is…another side of Justice? 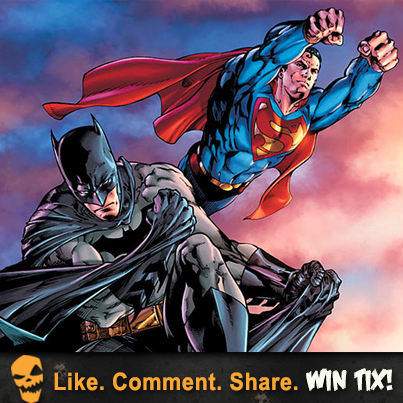 The Dark Knight and the Man of Steel go toe-to-toe in the newest superhero flick: Batman vs. Superman – Dawn of Justice. When the Caped Crusader (Batman) takes on the Shining Beacon of Hope (Superman), you can bet that there’ll be a fight of colossal proportions. If you haven’t already, check out the epic trailer for the movie! FIGHT NIGHT! Who will win? The saviour of the day, or the protector of the night? Find out for yourself with two tickets to see the movie, which comes out on March 25th. All you have to do is comment on one of our posts on Facebook, and you’ll automatically be entered to WIN! Superman and Batman are some of our favourite superhero Halloween costumes, so we’ve got a lot of discussion going on about who would win in a fair fight. We’re dying to know. Who do you think is gonna win? Here are our thoughts on who’d win an all-out superhero battle. Do you agree with us? Let us know on Facebook! You can also follow us on Twitter and Instagram for super-powered, Halloween goodness!